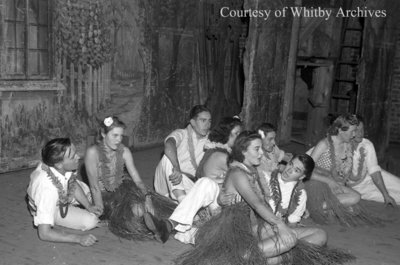 A black and white negative of nine unidentified performers wearing costumes on stage at the Whitby Town Hall. Their performance was part of the Romance Through Nations show held on October 20, 1939. In this view the men are lying on their sides and the women are sitting. They are all wearing leis and the women are wearing grass skirts. Romance Through Nations Show, October 20, 1939, Marjorie Ruddy. Whitby Archives A2013_040_782A.